Condo’s preoccupation with the figure and recurring imaginary characters is continued in these new works. Bow-tied butlers and leering nudes make fragmented appearances among the charcoal lines and patches of pastel and acrylic. On floor two, Condo continues to expand the Drawing Paintings with a series of works known as Compressions. In this series, the compositions are concentrated towards one corner; figures forms and colors are compressed to the extent that they become sculptural in their appearance. 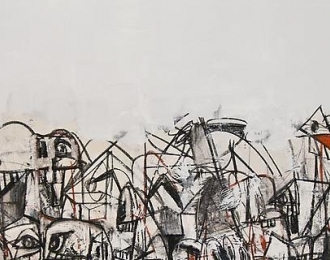 Condo’s visions are compacted into a massive block of gestures and brushwork.